Plot: Guy Carrell (Ray Milland) is plagued by nightmares of being buried alive and his fear turns into a very unhealthy obsession, straining his marriage with the lovely Emily (Hazel Court). Will he conquer his fears or will they consume him? I’m not entirely sure why I wasn’t more enthusiastically in love with “Premature Burial“, as it does a lot right without doing too much wrong. I was a big fan of Roger Corman during the early days of his career, back when he made quality horror features. I’m a sucker for foggy landscapes, gothic imagery, moody performances and Victorian Settings- all of which “Premature Burial” provides in heavy doses. Corman soaks the narrative in a spooky atmosphere, with the stand-out moments being the foreboding wedding or the colorful, trippy dream sequence. I also have to admit that he earned some pretty powerful jump scares, such as that introductory corpse or the face in the window. The acting is generally quite good, sometimes even exceptional and I thought the dialogue was mostly well written. The problem is that I eventually realized I had already seen “Premature Burial” before, back when it was called “The Pit and the Pendulum“- which had all of this awesomeness, but captured it in a much more compelling narrative and also had Vincent Price as the lead. “Premature Burial” is still pretty good, but it’s overshadowed by similar, albeit better, movies. Apparently the protagonist was originally written for Vincent Price, but a contract dispute between Corman and AIP prevented this from happening. Ray Milland is an adequate replacement and he does bring a certain grimness that made “Premature Burial” feel a little bleaker than Corman’s other films. But he never is able to completely make the role his own, with the dialogue and mannerisms constantly reminding me of Price, whom I- and everyone- thinks would’ve felt more natural in this part. The script sometimes becomes dense with dialogue, which can get a little dull and Milland wasn’t always able to hold my attention. Price would’ve likely been able to bring even the most boring sequence to life, but I want to make clear that Milland does fine. He’s good and I only wish that they would’ve re-written the role for him, instead of forcing the man into the uncomfortably large shoes of Vincent Price. The narrative is often repetitive and directionless, with many scenes dedicated to the same conflict. Emily will try to help Guy, who will coldly and often rudely rebuke her, only to soften up and reconcile with her…before succumbing to his fears and repeating the process all over again. Throughout a large chunk of the movie, I wasn’t completely sure where the story was going. Guy builds his own coffin, designed to be easy for escaping if he ever is buried alive, which is a great segment. But it’s finished relatively early on and while we know that he will probably find himself suffering a premature burial, we’re not entirely sure what will lead to it and what will follow. Perhaps he’s going insane, but he never seems threatening to anyone else, so it’s not like we really fear him. In “The Pit and the Pendulum“, we begin the story suspecting that Vincent Price may have murdered his wife, which makes the audience uneasy around him, providing suspense. Here, we only think that he might be a danger to himself, which isn’t ‘As’ compelling. Or maybe someone is scheming to drive him insane, but the audience isn’t really given the pieces to put this together. Eventually I began to figure it out, but not because of the information presented by the script…I figured it out because I had seen “The Pit and the Pendulum” and deduced every twist based on that. Of course, the biggest difference between “The Pit and the Pendulum” and “Premature Burial” is that the latter is intentionally trying to shroud itself in ambiguity. Because it doesn’t want to reveal anything that might directly spoil the twist, it has to limit having horror oriented content. This means that there aren’t going to be many thrills, nor will the mystery ever feel like it’s progressing. This is a bold storytelling tactic and I do admire the effort, but because Corman is using such a familiar formula, it only serves to make “Premature Burial” seem uneventful compared to Corman’s previous Poe adaptations. On the flip side, I think Corman was aware that we’d recognize the conventions, so provided at least one twist that defied our expectations. Even though you might be worried that the story is going nowhere, I did think the ending was pretty intense. I cared for the characters enough to be engaged, although there are some annoying loose ends. I didn’t understand some of the motivations and I found myself wondering what Guy did for a living. It’s implied that he’s some sort of Doctor or Scientist, but his tomb was so elaborate that he could’ve been an architect. Considering “Premature Burial” is somewhat of a chilling, gothic character understudy, I do expect that kind of stuff to be clarified. If I hadn’t seen “The Pit and the Pendulum“, I would’ve acknowledged the flaws and slow pacing, but I believe I would’ve focused on the good stuff. 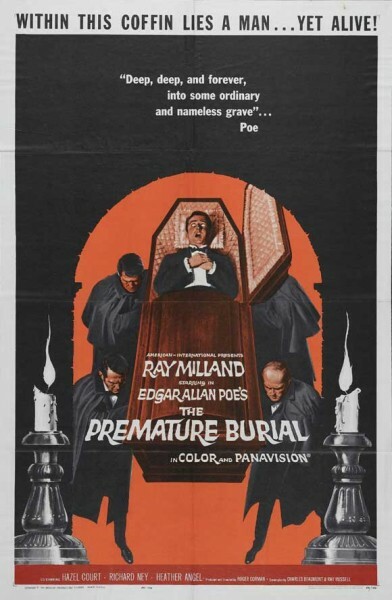 It works for the same reasons that all of Cormans’ Poe adaptations work- exceptional set design, cinematography, editing and acting, but “Premature Burial” constantly forces us to draw comparisons to Cormans’ elite and that works to the films’ detriment. Violence: PG-13 worthy, as there is some disturbing imagery. Overall: “Premature Burial” is more of a Gothic Drama than a horror film, but I think would’ve been more effective if it didn’t recycle a formula that was already becoming stale at this point.